August means one thing in Edinburgh – the Fringe – and twelve Peebles based youngsters are heading off next week to seek fame, fortune and glory. 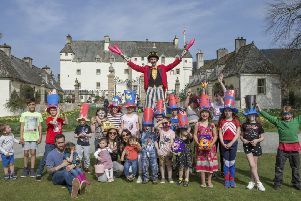 The performance comes courtesy of the junior division of Shakespeare at Traquair, which aims to “experience and promote the works of Shakespeare at Traquair House”. But the group has set its sights well beyond the boundaries of its home. With performances from August 7-15 at theSpaceUK’s prestigious Niddry Street venue just off the Royal Mile, the youngsters are looking to repeat the success of their sell-out Borders tour in the spring, when audiences in Biggar, Carlops and Peebles were regaled by fifty minute adaptations of The Comedy of Errors and Macbeth. The Comedy of Errors is well known for its multiple cases of mistaken identity, but toss in a melodramatic matriarch and a rowdy mob and it’s very much a case of Carry on Chaos meeting Laurel and Hardy. There’s a lot for the cast to get across in fifty minutes, but the show I reviewed in the spring was clear, crisp and concise and with lots of noise to appeal to the younger end of the audience. But how did Macbeth end up as a comedy as well? Not even director Tim Wilcock, who adapted both plays, can explain that. But the performance I reviewed was hilarious, made all the more so by the dead-pan delivery of the cast. The way 11-year-old Anna Tweedy as lead witch and murderer is able to hold the audience in the palm of her hand is uncanny. Watch out too for the exquisite comic timing of David Rees as her sidekick. With Dom Davies as the wimpish eponymous hero, Ruth Tweedy as a chilling Lady Macbeth and a lot of multi-part playing from the rest of the cast, this is a really innovative take on an iconic tragedy. With final rehearsals underway, there’s a mixture of tingling excitement and tension amongst the cast. Hardly surprising as, for most, it’s their first appearance at the biggest arts festival on the planet. an educational experience as well as being good fun”. With over 3000 shows to choose from, this troupe will have to work hard to meet that challenge but they deserve to succeed. These are two cracking shows, true to the storyline but never letting the plot get in the way of a good joke, verbal or visual. It’s theatre that’s genuinely suitable for grandparents through to grandchildren. You can see The Comedy of Errors at 11.30am on August 7, 10, 12 and 14 and Macbeth at the same time on August 8, 11, 13 and 15. Both shows are at theSpaceUK, Niddry Street (Venue 9). Tickets are £8, £5 for children or £20 for a family of four from either Fringe Central on 0131 226 0000 or 0131 510 2383. Make a day of it – you won’t be disappointed.